The party is over, the dust has settled and now it’s time to thank Grandpa Paul for that soup terrine you’ve always wanted…and nothing says thank you like an old fashioned, hand-written note. Luckily, Mixbook has your back! People love to see the happy couple so a great idea is to send something that takes your guests right back to the celebration. Mixbook’s Classic Wedding Typography card has room for three photographs that capture your happy day. Or if you’re down to the wire with no time to sort through proofs, Mixbook’s Sweet Cactus Thank You is a great way to go, with simplicity and elegance that doesn’t sacrifice individuality. Mixbook’s Classic White Wedding, is another one of our favorites – We love the gold calligraphy design aesthetic and the one meaningful photograph that says it all. "When do I send wedding thank you cards?" Contrary to popular belief, you do NOT have one year to send out your notes. Custom dictates that you have three months from when you receive the gift to send out your thanks. The best idea is to have your notes on hand, and to write a few a day as the gifts come in. You’ll be surprised at how much easier it is this way! "What do I write in my wedding thank you cards?" Be personal in your note – and honest. Do tell a guest that you are excited to use the blender that they gave you in the mornings to make your favorite smoothie. Don’t tell a guest that the blender clashes with your kitchen and is going back to the store. Do show your appreciation to those who did you a solid: the neighbor who watered your plants while you were away on honeymoon, the coworker who hosted your shower, the wedding planner who saved the day in the rain. Anyone who showed you kindness during your special day should be thanked and that includes mom and dad if they helped foot the bill. Don’t send a generic card out to everyone with the same wording that doesn’t recognize the person or the gift specifically. Lastly, it’s all right – but not necessary – to mention dollar amounts when you receive cash gifts. It is always appropriate however, to tell the giver how you intend to spend their gift. If you have decided to go with a photo thank you card, try to choose a picture (or pictures) that feels iconic. The Bride and Groom dancing is always a favorite choice, as is a special moment captured of just the two of you. The happy couple as they say their vows, remarkable backdrops, and specific items that everyone will remember (like that handmade quilt the guests all contributed to) are also great selections. "How do I send out my wedding thank you cards?" Mr. Beauregard Blue and Ms. Kelly Kline. No nicknames, no initials and no symbols. If you have the space, it’s appropriate to write out the state and all abbreviations like Post Office, Avenue, Apartment as well as Doctor, Reverend and Lieutenant Marshall. Children under eighteen should be listed under their parents’ names on the card, while children over 18 (even if they’re still living at home) should receive their own. 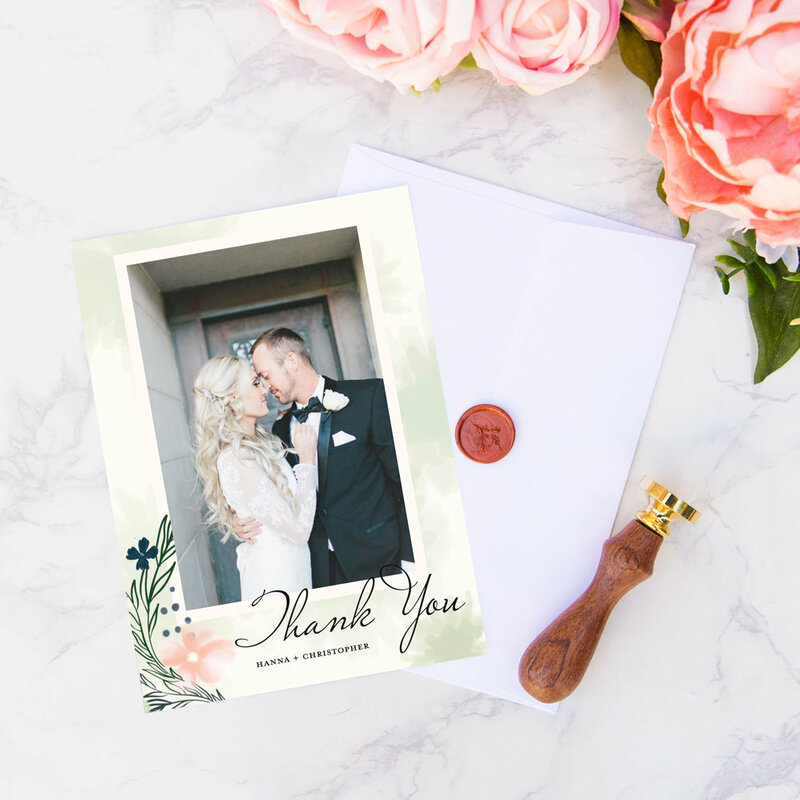 Choose from one of our professional Wedding Thank You Cards designs or create your very own!